I have no idea what to write about today. To complicate matters, I'm not even writing today's post...today. I'm writing it a couple of days in your past. I'm actually trying to stockpile a couple of posts now, just in case the rest of my week is busy and annoying. Which it looks like it just might be. So, as I sit here, alternating my time between staring at a framed John Byrne Wolverine page I have over my desk and staring at the row of graphic novels I have currently sitting on my desk, inspiration struck. My "office" (it's in quotes because one needs a job to have an actual office) looks a lot like a comic book shop. And a darn good one, at that. There's some interesting original comics art up on the walls, and a healthy selection of trades and hard covers, all neatly lined up and in easy-to-locate order, sits in rows and rows on a number of bookshelves around the space. The space is dusted, and one can walk around freely without tripping over anything. And there's plenty of light, so checking everything out is quite easy. So I got to thinking. 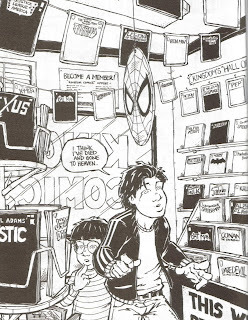 What, exactly, would my own, personal, ideal comics shop actually look like? What kinds of product would I want the store to carry? Would it be heavily weighted towards newer books, or back issues? What about a perfect balance of the two? And would I have more independent and small press comics on my shelves than most run-of-the-mill comics shops in operation today? How about statues, and the more expensive stuff? Would I bother with stocking toys and action figures? Do they take up too much space? What about CGC graded comics? Is there a big enough local market for that kind of thing? Speaking of local markets...where, exactly, might I put such a store? There are already a few in my general area, so perhaps I'd move it further upstate. Near a university would be pretty good, I think. Or maybe near a bookstore--try to get some of their customers to give comics a try. Nah. That would just slice up my own potential clientele. And what about the Internet? Would I utilize the Web to its fullest? Maybe store all back issues someplace off-site, and only sell them online, in an eBay store. That way, I'd be able to have more physical space in the shop itself. Possibly for gaming tables, or a couch, or an espresso maker. And speaking of stock...how much would I carry? How many copies of each trade paperback should I order when they come out? How many copies of each new release should I order? How much money will I need to spend every week, just to get new books in? And how much does a real, high quality espresso maker actually cost? What about a full-on bar? Would they even give a liquor license to a retail store? And would I want people drinking around my merchandise? Lots of questions, and for once, I actually have a few answers. I think it's every comics fans' dream to do one of two things--first, to either write or draw (or both!) comics for a living. And second, to own and run a comics shop. So, naturally I've thought about such things before, and I think that might actually make for an interesting post. But first thing's first--I want to hear from you guys. What would your ideal comics shop look like? What would some of the essential features be? What kinds of books would it carry? Leave comments and let us know, and then, if there's any interest at all, I'll do a (probably too long and pretentious) post about what my ideal comics shop would look like. So, please, drop us a line if you feel like it, and tell us about your shop! My idea comics shop would serve neither food nor drink; there's just too much potential for mess in all kinds of way, plus it's a comics shop, not Borders. Of course, it wouldn't hurt if it happened to be in a mall or shopping center near a number of eateries. The one in Chambersburg was pretty nice; it managed to have pretty much anything I ever wanted; one wall was devoted to the new releases of the big two plus tables and smaller racks for others. Under the tables were boxes upon boxes of older issues. The opposite wall had bookcases for trades and various RPG books. Showcased issues were on revolving racks toward the front. Upper wall space was filled by posters and wall scrolls, with the odd promo poster or large banner hanging down from the ceiling. The middle of the store was filled with tables holding cases for CCG singles, usually Magic. The front of the store had large display cases for larger, collectible figurines and statuettes as well as Hero Clix. All of the boosters/decks/small things were kept up front, by the register. A lot of the more valuable stuff was showcased on the wall behind the register for obvious reasons. There were also a few small tables by the register where you could play Magic or talk with friends; Friday Night Magic and tournaments took place in front of the store, where they set up tables in the mall proper. The store had a membership system, which allowed you to subscribe to comics and reserve issues; the store would make sure to always put those comics in your bin (and it helped them order enough to cover everyone) -- you could go in and buy out your bin at any time. Most customers, as I recall, were pretty good about that, even if some didn't show up for six months at a time. The shop you describe sounds a bit like one or two places I've seen, though I like the membership system; I don't reserve comics, so I'm not sure if any of the places around here actually have that.